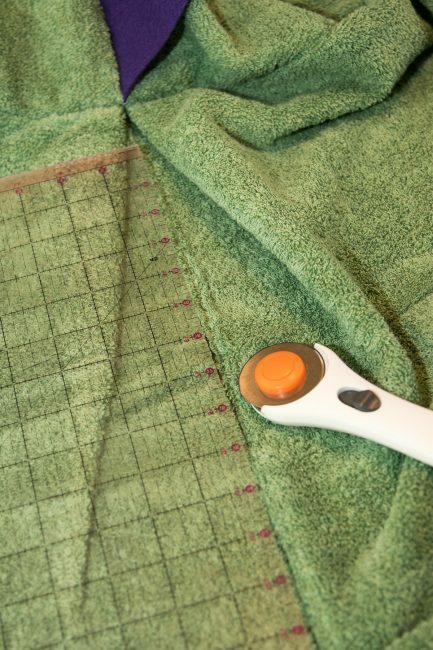 How to Sew a Hooded Towel - Peek-a-Boo Pages - Patterns, Fabric & More! 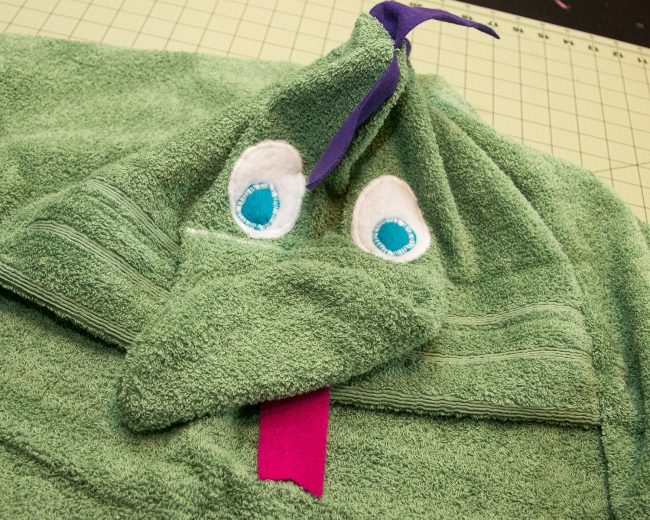 Hi guys, Genie from the Sew and Tell Project here today, and we’re going to make a fun hooded towel! I chose to make a dragon, but you could easily alter this to make many fun characters! 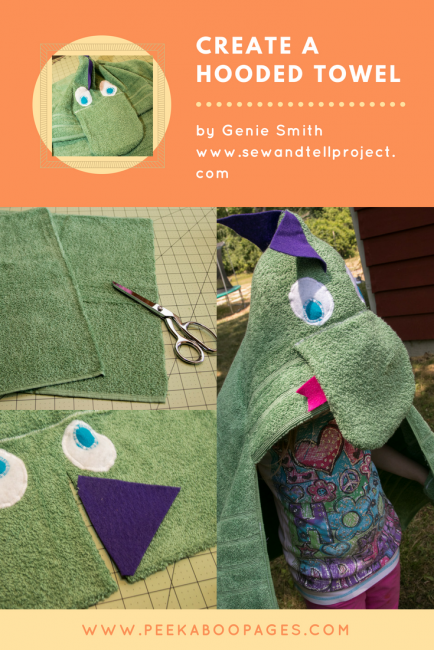 I’ll walk you through the construction for my dragon, and give some tips on creating just a simple hooded towel and some other creatures. You’re going to need a regular sized bath towel, and a matching hand towel. 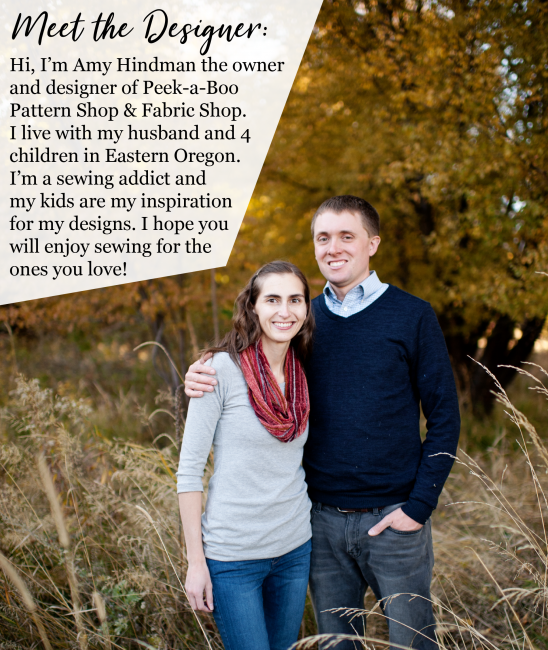 You’ll also need some basic sewing supplies: a sewing machine capable of straight and zig zag stitching, matching thread, scissors and/or a rotary cutter, and pins. A ruler or strraight edge may come in handy, too. 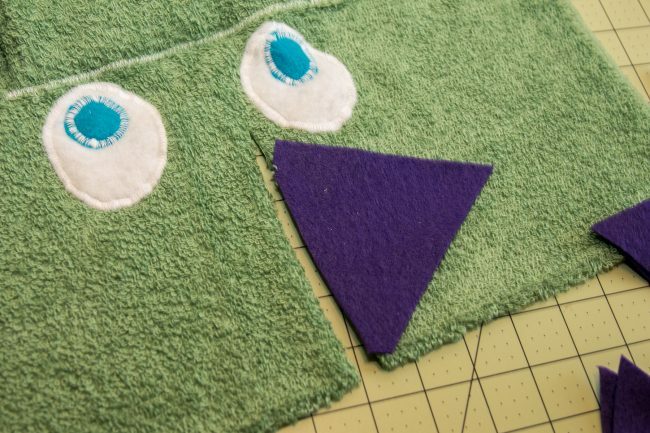 If you’re going to make a creature, you’ll need felt in appropriate colors or a hand towel (depending on what you’re making, a washcloth may suffice). 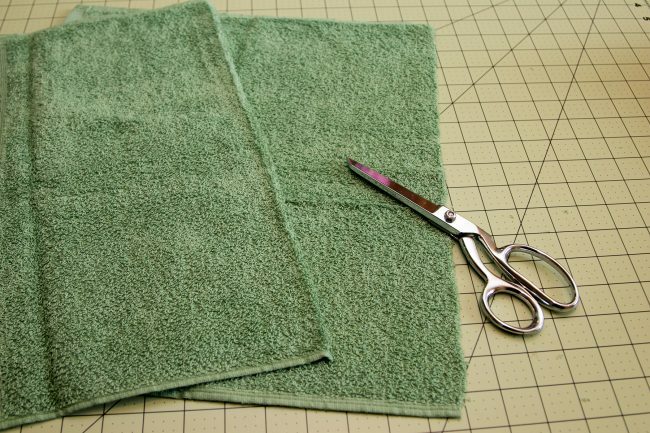 The first thing you’re going to do is cut your hand towel in half. You do not want to cut it the long way, you want to end up with two almost square pieces. Next, turn up the finished edge 3-4″, wrong sides together, and sew closed. You can change the width of the amount you fold under based on how deep you want the hood to be. Next, take the other half of the hand towel and cut out two half circle-ish pieces. These will be your creature’s nose. 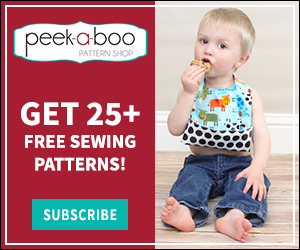 Sew them together around the curve, leaving the straight edge unsewn, and turn right side out. If you want teeth for your creature, here’s where you’d add them: cut out white triangles (or whatever shaped teeth you want) and place them with the points facing in along the perimeter of the curve. Place the other piece on top of the teeth, with the right sides of the towel together. When you turn it right side out, the teeth will be pointing outward. 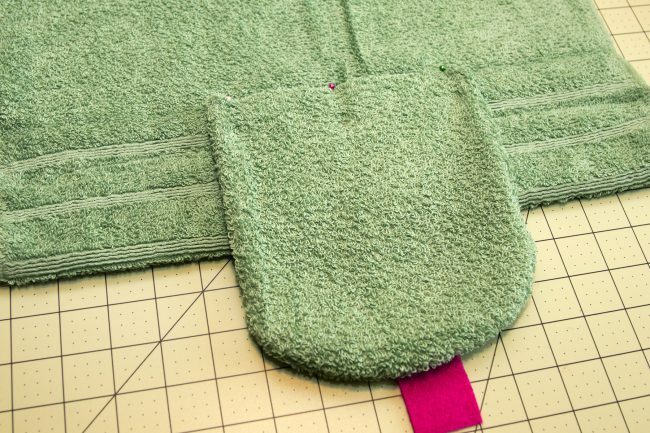 Going back to your original half of the towel, flip it over so that the piece you sewed down is underneath, the folded edge is at the bottom, and the raw edge is at the top. 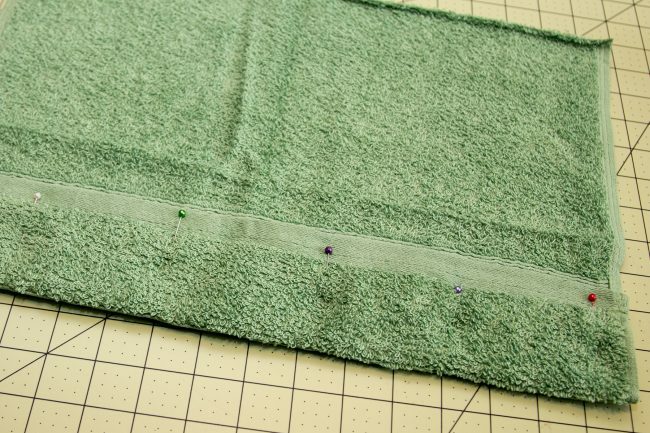 Place the unsewn edge of the snout along your stitching line and pin in place. You can see a small piece of pink felt here on mine; this is my dragon’s tongue. You could add fire instead! Just sandwich it in between the snout and the hood and be sure to catch it in your seam (if you miss, just stitch it down). I recommend using a tight, wide zig zag stitch here (set your stitch length short and the stitch width long) because it will help catch in the raw edges and prevent unraveling. And this is the tongue underneath! Next, we’re going to cut out two white ovals from felt, and two smaller circles. The ovals will be the white of the eye, and the circles the pupils. 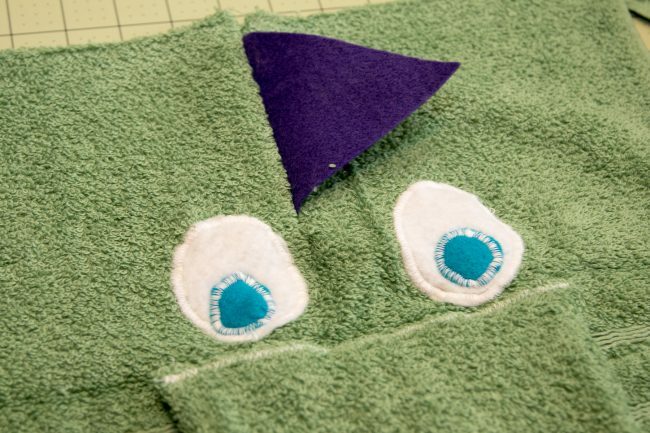 Use a tight zig zag stitch to applique the eyes on. You can use double sided applique medium to hold them in place while you stitch, if desired. 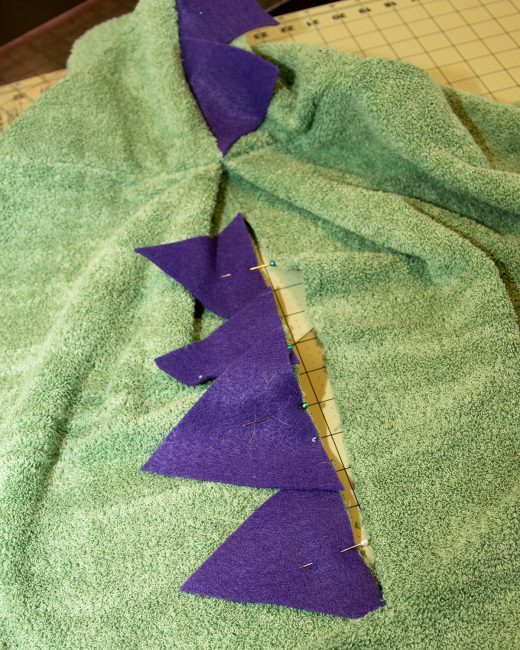 Next, cut out some large triangles from a coordinating felt color to make your dragon’s spiky mane. Cut a slit on the halfway point of the hood, from the raw edge to right between his eyes. This is what your hood should look like. You could add some embroidery to the snout area for nostrils, if you like. Also, if you’re prefer to use towelling or other fabric for the tongue, fire, spikes, or other features you’re adding, just be sure to cut two pieces, sew them right sides together, and turn right side out so you won’t have frayed edges. To finish the hood, fold the face in half and sew the raw edge you see on top of the above photo together, You can add a few spikes in that seam, too. 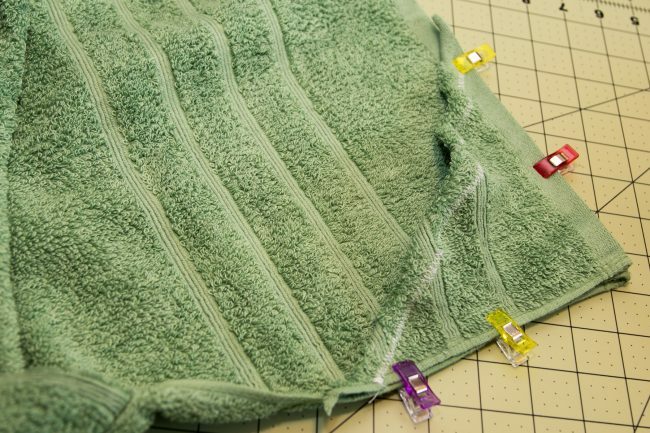 Before attaching my hood to the towel, I make a pleat in the towel. It feels like it helps the towel wrap around its wearer, and it gives it some volume. This is the underside of the towel, and it definitely helps to baste it in place. 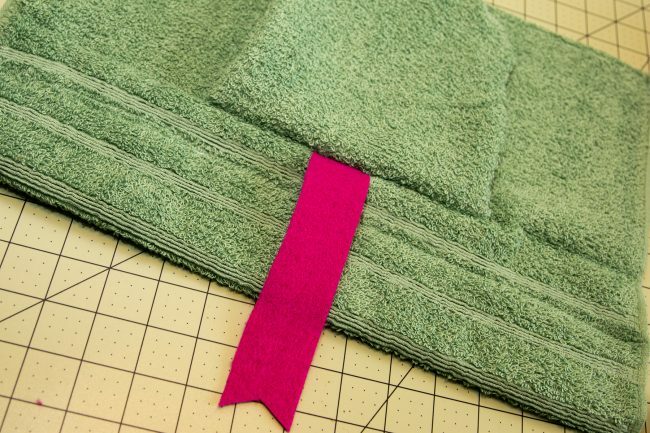 Flip your towel over, so the pleat is on top, and pin your hood’s unfinished edge to the edge of the towel, centering both right in the middle. I forgot to take a photo of this step, but the face you just made will be the right side of the hood, and the side of the towel with the pleat will be the right side, and make sure those are together, then sew. Again, a tight zig zag is a good idea here. 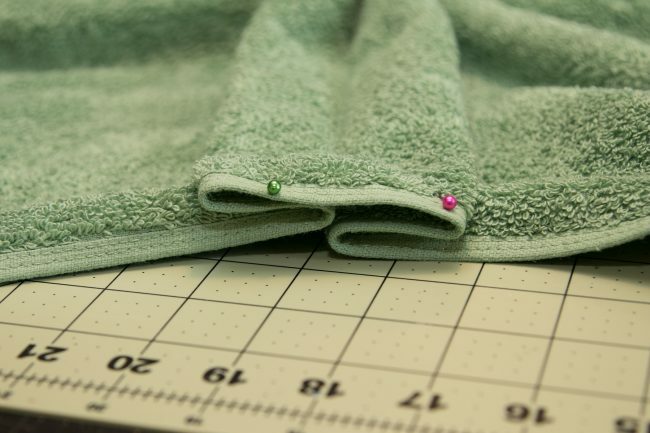 Next, I wanted to add a few more spikes on the towel part of my hooded towel, so I cut a long slit in the middle of my pleat, on the right side of the towel. 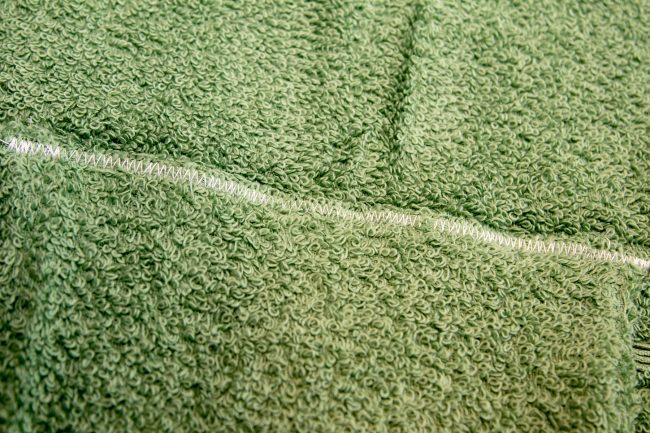 I laid my spikes out, overlapping some, and then folded the slit so that the right sides of the towel were together with the spikes sandwiched in between, and then sewed it shut with a tight zig zag. Finally, I used the last bit of my hand towel to make little pockets for little hands to help hold the towel closed. I just cut triangles off the final end. I turned the unfinished edge under and stitched it down, and then lined up the two finished edges with the top, inside corners of the towel. Then sew them down.